THESE ATTRACTIVE LUMINARC SERVING PIECES ARE IN THE ROSALINE SWIRL PATTERN. THEY WERE MADE BY J.G. DURAND OF FRANCE. ALL ARE IN EXCELLENT CONDITION. THE LARGE BOWL HAS A 10" DIAMETER AND STANDS 4" HIGH, WHILE THE SMALLER BOWL HAS A 7" DIAMETER AND HAS A HEIGHT OF 3". THE OVAL SERVING PLATTER IS 14" X 9". OTHER PIECES ARE ALSO AVAILABLE. 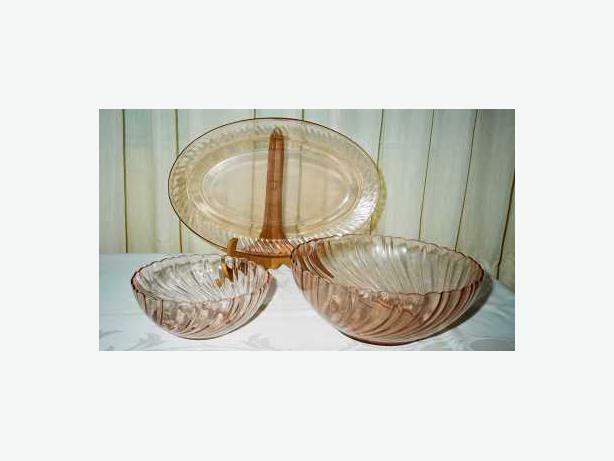 FOR OTHER GLASSWARE ITEMS, VINTAGE COLLECTABLES AND ANTIQUES PLEASE VISIT MY OTHER ADS.